Cape buffalo and lions are life long enemies. A fully-grown buffalo will feed a family of seven lions for a week. The lions watch and learn before a kill. They will seek out the aged, the weak, the injured, or the young. These lions look so hungry, ready to make a kill soon or starve. A large collection of buffalo is better known as "the Black Death". They pool their size and strength to create a formidable force. As for the buffalo, they are in no mood to lose anyone in their family! 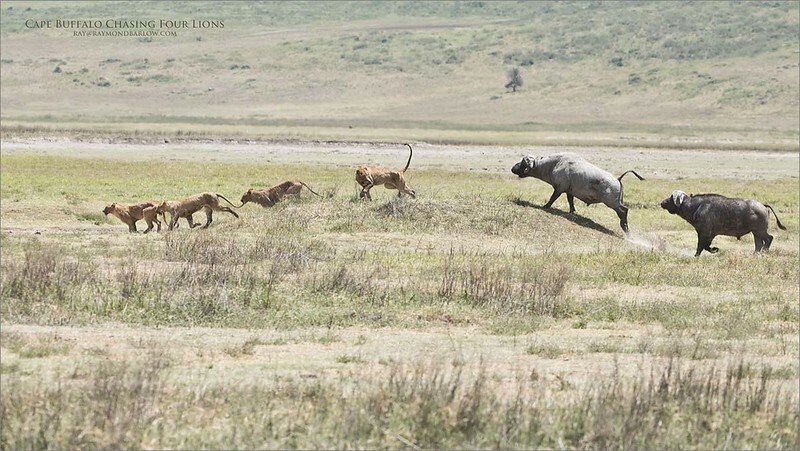 On the aggressive defense, they spend at least a half hour chasing the lions away from the herd. Survival is usually a game of “strength in numbers”. The largest force usually wins.